The NIAS Open College, a series of lectures intended for the general public including senior citizens, high school students and university students. It has been held annually since FY2008 with the aim of introducing the latest research topics in life science and agriculture in an easy-to-understand manner. Researchers from NIAS and other research institutes of NARO give lectures ranging from basic research in plant and animal sciences, genetic resources, crop improvement, GMO, and advanced technologies such genomics and genome editing. The NIAS Open College is organized in cooperation with the non-government organization Chinoichiba (Free Market of-by-for Wisdom). The lectures are conducted in Japanese only. The NIAS Open College 2017 is scheduled from September 30, 2017 until January 6, 2018 at the Ochanomizu University. A total of 15 lectures with the theme "Improvement of crop varieties to save the world" focusing on the history of crop breeding programs, strategies for developing new crop varieties, and some of the latest achievements on breeding research will be conducted in 8 sessions. This lecture series is open free of charge to the public including high school and college students. 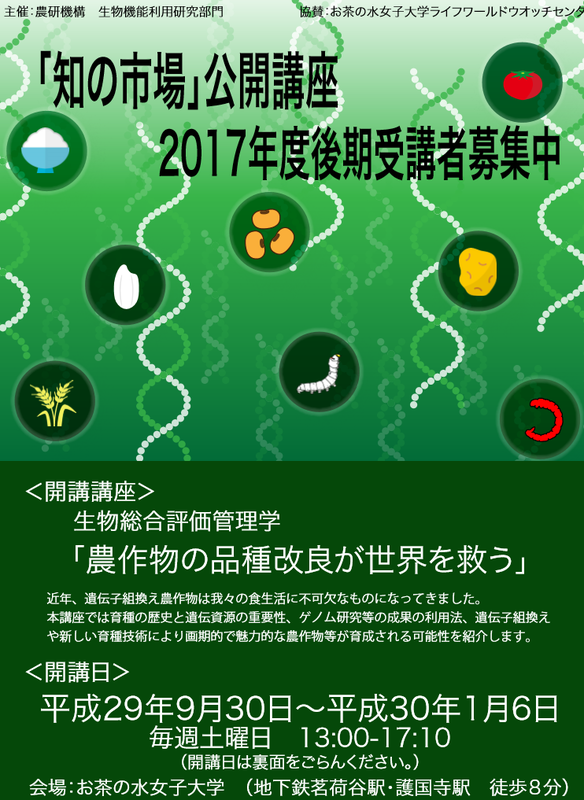 The lecturers that include researchers from NARO, the University of Tsukuba and other research intitutes will introduce research topics ranging from new breeding techniques, genetic recombination and genome editing in an easy-to-understand manner.